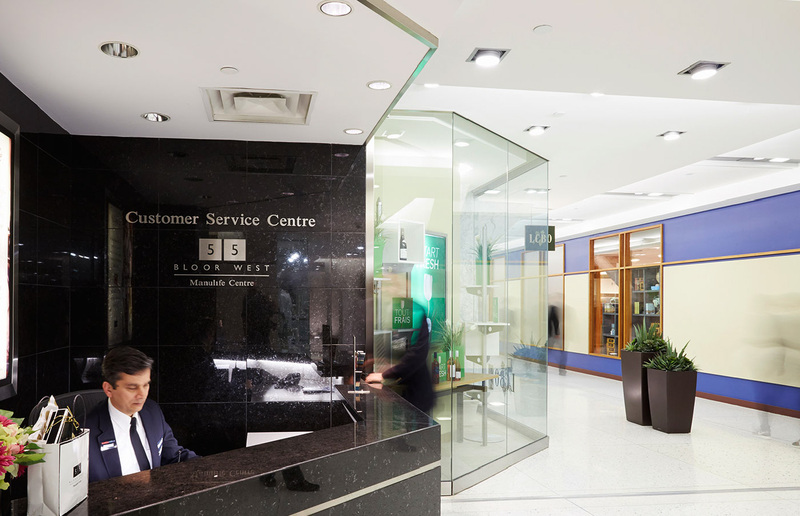 Whether you’re new to Bloor & Bay or just looking for something new, our guest service associates can help direct you. They’re at the Customer Service Centre on the concourse level. Here you can pick up city guides and Manulife Centre gift cards to be used at participating merchants. Contact our Management Office Monday to Friday between 9:00am and 5:00pm at 416-323-2860, or leave a message after hours. We can also be contacted via email: Emilio_Hernandez@manulife.com. Parking validation is available at the Customer Service Desk on the Concourse Level. Present your parking stub during customer service hours with proof of a $25 purchase from a single — or combination of many — Manulife Centre stores. • Only one validation per ticket. • For a lost parking ticket, the maximum daily rate will apply. For validated parking rates for patrons of Cineplex and The One Eighty, see Parking Rates. We are now pleased to offer complimentary valet parking in our parking garage. For access to the valet, follow directional signage on P1 to the valet booth and let us do the parking for you. Our valet service is available from 10AM – 7PM Monday to Saturday (hours subject to change). Returning to your car after 7PM? Contact our security office at 416-961-4998. • Cineplex patrons receive four hours of parking for $3.00 after 6:00pm Monday – Friday, or anytime on weekends and holidays with parking validation. • The One Eighty patrons receive four hours of parking for $3.00 after 6:00pm. Have your car professionally cleaned while you shop, dine or take in a movie. Our car detailing service is conveniently located on parking level 3. Pull in for details or call 416-920-8630.